Leaving the low lying land of Kingshouse the West Highland Way slowly ascends until the Devil’s Staircase (550m). 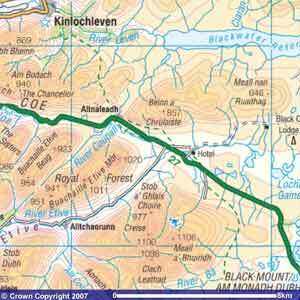 From here it is a slow decent to Kinlochleven. Leaving Kingshouse the route shadows the A82 until Altnafeadh; before here though and only about 1 km out of Kingshouse there is a choice of two paths. The higher route and easier one, follows the old military road, the lower and slightly longer road follows River Coupall. Both route meet at Altnafeadh where the strikes out right and north away from the A82. The route should not present any difficulties for anyone who has a little walking fitness. The name Devils Staircase really makes it sound much harder than it is; it is a zig-zagging path to the top. Once you’re passed the Devil’s Staircase the route is open to all weathers. Have a compass and map and know how to use them. It is not a good place to have to wait out any mist or snow clearing before being able to move on, as there is no shelter. That said it is a glorious part of the route, with stunning view of the mountains around and the Glen at Glen Coe. Leaving the top of the Devil’s Staircase the route wanders along flatly for a while before beginning to slowly descend. The decent becomes steeper the closer you get to Kinlochleven, eventually joining the old works road, leading down into the town.